This chic little bistro - with its designer wallpaper, banquette seating and rough stone walls – has an intimate, cosmopolitan vibe, and is popular with a discreet and sophisticated creative crowd. The modern European menu is guaranteed to impress, we love the roast duck breast with fresh raspberries and Drambuie; lamb loin and haggis wrapped in puff pastry & coated in cracked pepper sauce; and the sea bass cooked en papillote with hot ginger and lemongrass prawns. 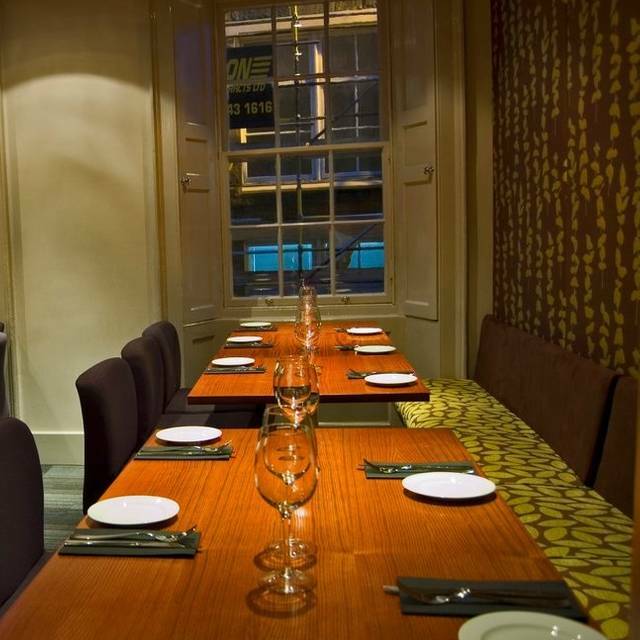 Ideal for stylish working lunches, and informal evening meals, Iris also has an extensive wine list and a growing selection of beers and craft ales. Please note that due to licensing laws, children under 6 years of age are not permitted on the premises at any time. Overall really enjoyed our meal at the iris. Food and wine was excellent as was the service. Only very small gripe was were sat right at the door at a quite cramped table and when other customers would come in or go out we had to keep closing the sticking door behind them. Other than this it was a very nice meal and evening. Would eat here again. I visited Iris with my family - Mother Sister and Brother in Law. Staff were friendly and we were seated straight away even though we were early. Nice quiet atmosphere with soft lighting. 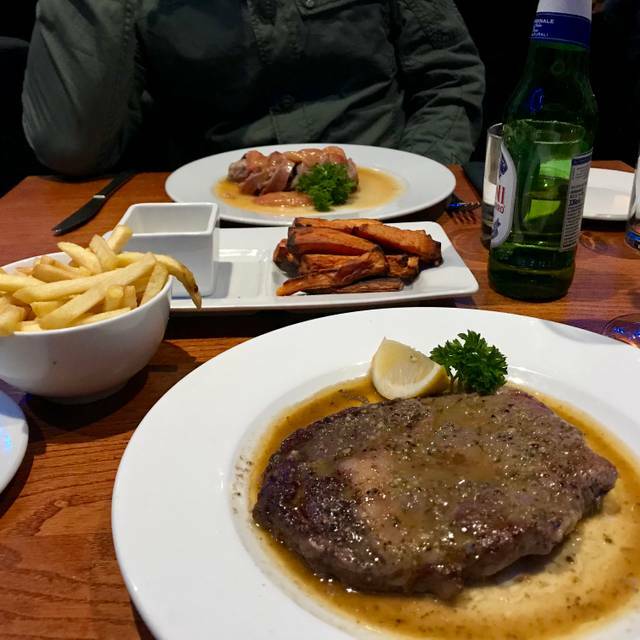 Food was delicious - Rib eye steak in particular was fab. Definitely worth a second visit. We were looking for a restaurant with good food and service. We couldn’t have chosen better. The food was absolutely delicious with nothing processed about it. The service was first class and it was good value for money. Would love to go back if we visit Edinburgh again. It was many years ago, we went to Iris, and the meal was delicious that time. This time we certainly weren’t disappointed, great food, good service, we’ll be back. Food was good quality and tasty, however portions are on the smaller side I feel, even with added side dishes - I was a bit peckish later in the evening! That doesn’t detract at all from the quality, the service was great, good atmosphere and a cosy vibe. Would return if in Edinburgh again. We have been to Iris a number of times and thoroughly enjoyed it. However, this visit was very disappointing because if the length of time it took to get our food, an hour until our starter arrived, and also the fact the staff failed to deal with this. They did not inform us of the wait and in fact tried to avoid coming over to us. The food when it finally arrived was very good. This was a birthday meal and luckily the food helped compensate inadequate service. Eaten here several times before in the past and food was great. Unfortunately on this occasion Friday 14th Dec my main (pheasant ) was dry and lacking flavour. Dessert sounded tempting but lacked the wow factor. Overall ok and would not dismiss completely but considering the choice in town may leave it a while. Iris, one thing would sort out is your toilets, they are dire. Need upgraded and kept clean. Nice place and when food arrived it was very good. The service was very slow and time between starter and dinner was lengthy to the extend of finishing a bottle. Perhaps these issues were magnified as where we were sitting at the back of the restaurant it freezing, so much so we ate with our coats on. Get the windows draft proofed and this restaurant could be a wee find. Friendly, efficient staff and excellent food. Sitting near the door in winter is however not advised. We booked for an Anniversary lunch and visit to Christmas markets. I had the lemon sole with smoked salmon, it was beautifully cooked and the sauce was delicious. Portions were good and we were certainly well fed! Would definitely recommend Iris for a place to meet friends for a quiet meal away from the busyness of the Christmas shoppers. Staff were pleasant and cheerful. Will definitely be back. We were a party of four with differing tastes - it is to the chef's great credit that we all thoroughly enjoyed our a la carte lunch. Was there for the Christmas Lunch set menu. Everything was delicious and the service was excellent. Works Christmas lunch for six, excellent quality food for a very reasonable price. Would definitely return. I enjoyed a Festive lunch with 5 former colleagues at Iris on Saturday 8th December. We were made very welcome and although the restaurant was full the staff were very friendly and efficient. 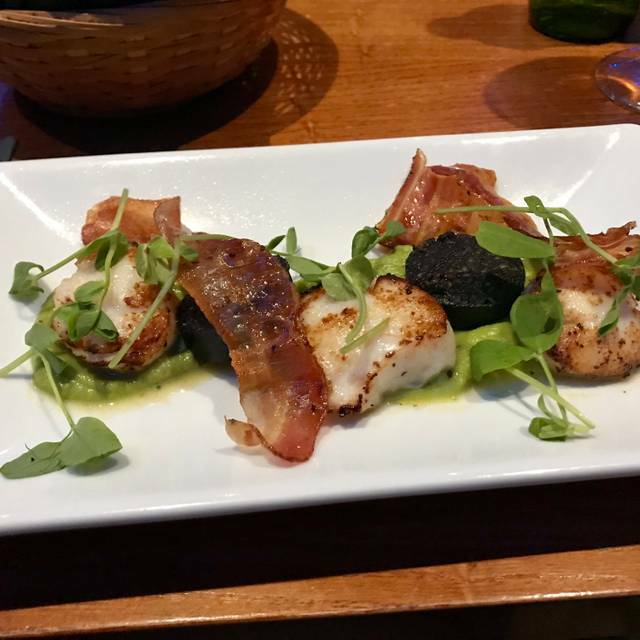 The food was superb and it was very reasonably priced. Not only were we provided with the Festive Lunch Menu but we also had the option of choosing from the a la Carte menu. We shall look forward to booking again next December! I thoroughly enjoyable Christmas lunch including a juicy home made Christmas pudding. Good central location but in a quiet street so very handy for a break from Christmas shopping. Enjoyed by both mother and daughter! Good value and excellent service too. Excellent lunch with my mum to celebrate her birthday. A good Christmas menu with enough options to keep my gluten-free friends happy. Vegetables were very over cooked, though. Christmas pudding was home made and excellent. Took friends for their first visit and they thought it was excellent. I have been several times because it is such good value. Very friendly & helpful staff - good food & value for money. In the area by the bar/entrance. Freezing hurricane every time the door opened and door is self closing so diners took turns to get up and close the door! Became a bit of a laugh with a good crowd but annoying still. We all thoroughly enjoyed our lunch, clean plates on every course! Christmas menu was lovely with a great choice on every course. 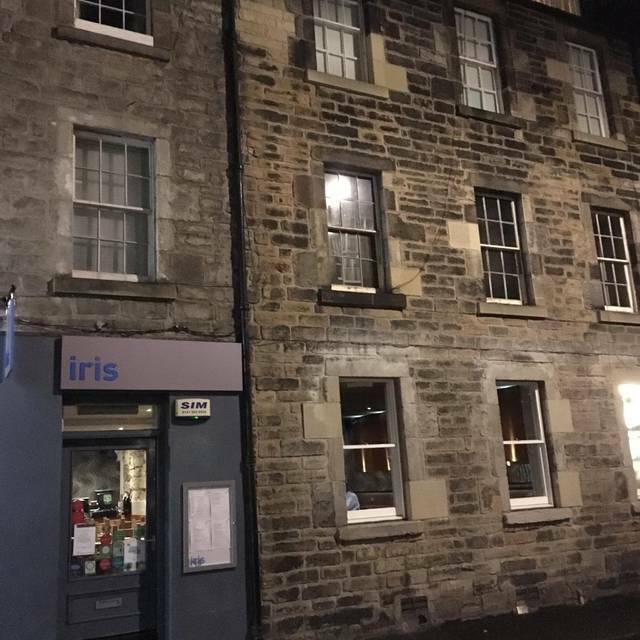 Have been to Iris on a number of occasions and have never been disappointed with the quality and choice of food. Highly recommend. A relatively small restaurant, centrally located. A reasonable, though short, menu with good value prices for the centre of town. Food was good and well presented. A small wine selection with a few wines under £20 a bottle. Service was friendly and well attended. A little cramped and very noisy when full. Would still recommend it. As always, the food was great and everyone was friendly. Only gave it a 4 due to slow service this time. The wait staff were overwhelmed and their timing was a bit off and inattentive. I and the table next to me had to request our checks several times. I arranged a lunch for family gathering on Saturday and everyone had eaten in Iris previously but nobody had been for quite some time. It was great to discover all over again and to know that the same delicious food and friendly service has been maintained as before. We were a group of 7 and mostly ate different things from the menu but everyone was equally complimentary that they enjoyed the food a lot and for those of us on set 3 course lunch menu, it was exceptionally good value - the Pork Belly dish was a highlight for me! The staff were friendly and attentive and special mention to the girls who advised us to have a bottle of Prosecco and supplied Creme de Cassis rather than "upsell" 5 x Kir Royale's and also one who especially made some Espresso Martini's even though the restaurant dont serve cocktails! Enjoyed our catch up lunch. The starters were so attractive that we all ordered 2 starters. The wine was a reasonable price and the Sauvignon Blanc complemented our lovely food well. Service was attentive and friendly without being intrusive to a group of friends who had not met for 6 months. Relaxing atmosphere serving tasty food well presented served by friendly staff . Absolutely delicious food, service is top notch and the atmosphere is very comfortable. Mussels are a must! Enjoyed the meal. Was very busy so service was slow but staff were very attentive. Poached egg on fishcake wasn't runny but apart from that no complaints with the food. Tables a bit close together but again understand this when busy. Pleasant relaxed atmosphere with well presented varied food served by friendly staff . Great as always. Iris never fails even on s quiet Monday night felt welcome and inviting.